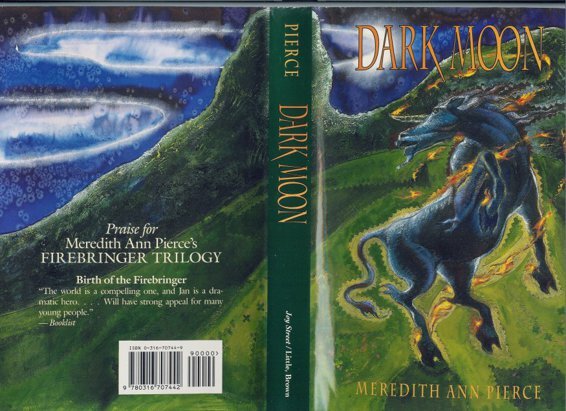 He was the youngest prince the unicorns had ever known, and his name meant Dark Moon. Aljan son-of-Korr was swart as the well of a weasel’s eye, the night-dark son of a night-dark sire, with keen, cloven hooves and a lithe, dancer’s frame, a long horn sharper than any thorn, and a mane like black cornsilk blowing. While still counted among the colts, young Jan had won himself a place in the Ring of Warriors. Upon the death of his royal grandsire, Jan had seen his own father declared the king and himself—barely half-grown—made battle-prince. During time of peace, Korr the king would have ruled the herd, but because the unicorns considered themselves at war, it was to Jan, their prince, that the Law gave leadership. His people’s bitterest enemies, the wyverns, dwelt far to the north, in sacred hills stolen from the unicorns many generations past. Vengeful gryphons held the eastern south, barely a day’s flight from the great Vale in which the exiled herd now made its home. And hostile goat-footed pans inhabited the dense woodlands bordering the Vale. Such were the uneasy times during which this young prince came to power. I am his chronicler, and yestereve I spoke of his warrior’s initiation, during which the goddess Alma marked him, tracing a slim silver crescent upon his brow and setting a white star on one heel in token that one day he must become her Firebringer, long prophesied to end his people’s exile and lead them triumphant back to the Hallow Hills. Tonight, I resume my tale little more than a year after Jan’s accession: it was the afternoon of Summer’s Eve. The morrow would be Solstice Day, when thriving spring verged into summer. Jan stood on a lookout knoll high above the Vale, rump to the rolling valley below, black eyes scanning the Pan Woods spilling green-dark to the far horizon, beyond which the Gryphon Mountains rose, flanking the Summer Sea. Cloudless sky soared overhead, blue as the sweep of a gryphon’s wing. Breeze snuffed and gusted through the dark unicorn’s mane, warm with the scent of cedars sprawling the slope below. Sun hung westering. Jan shifted one cloven heel and sighed. He was not on watch—no sentries needed this time of year: gryphons never raided past first spring. But the herd’s losses had been heavy that season in fillies and foals carried off by formels—the great blue gryphon females—to feed their ravenous newly hatched young. Brooding, the prince of the unicorns surveyed the folds of the Pan Woods before him. It was not the number of recent raids which troubled him most, but their manner. Always in springs past, wingcats had come singly, at most in mated pairs. This year, though, many of the raids had included more than two gryphons. A few had even consisted solely of tercels—male gryphons—no female at all. Jan snorted: clearly at least some of the spring’s forays had had little to do with a formel’s need to feed her chicks. Only silence replied. Jan’s skin twitched. With his long flywhisk tail, he lashed at the sweatsipper that had alighted on his withers. Vivid memory came to him of how, only the year before, the goddess had marked him with fire, granted him the barest glimpse of his destiny—and spoken not a word to him since. Standing alone on the lookout knoll, he felt doubt chill him to the bone. He wondered now if the voice of Alma and her vision had been nothing but a dream. A twig snapped in the undergrowth behind him. Jan wheeled to spot a half-grown warrior emerging from the trees. Pale dusty yellow with dapples of grey, the other shook himself, head up, horn high. Jan backed and sidled. Like a fiercely burning eye, the copper sun floated closer to the distant horizon. The other snorted, ramped, then whistled a challenge, and the prince sprang to meet him. Horns clattered in the stillness as they fenced. A few more furious strokes, then the pair of them broke off. Jan tossed his head. Grinning, the dappled half-grown shouldered against him. The prince eyed his battle-companion Dagg. Jan shook himself and nickered, not happily. Again his shoulder-friend snorted, as though the very thought of gryphons stank. Jan nodded, champing. Dusk wind lifted the long forelock out of his eyes, exposing the thin silver crescent upon his brow. Gloomily, he picked at the pine-straw underhoof with his white-starred hind heel. Beside him, Dagg shifted, favoring one foreleg. “How’s your shank?” Jan asked him. The dappled warrior blinked grey mane from his eyes and slapped at a humming gnat ghosting one flank. He flexed the joint. Behind them, the Gryphon Mountains stood misty with distance. The reddened sun above the Pan Woods had nearly touched the rim of the world. Lightly, Jan nipped his shoulder-friend. Dagg shook him off and fell in alongside as they started through the evergreens that forested the Vale’s inner slopes. Amber sunlight streamed through the canopy. Just ahead, a pied form moved among the treeboles. Jan halted, startled, felt Dagg beside him half shy. A moment later, he recognized the young warrior mare Tek. Her oddly patterned coat, pale rose and black, blended into the long, many-stranded shadows. Jan bounded forward with a glad shout, reaching to nip at the pied mare’s neck, but light as a deer, she dodged away. Tek nickered, shook her mane, back-stepping, laughing still. The young prince snorted, pawing the ground. The next instant, he charged. This time, the pied mare reared to meet him, and the two of them smote at one another with their forehooves, like colts. Tek was a lithe, strapping mare, strong-built but lean, a year Jan’s senior—though the young prince was at last catching up to his mentor in size. They were of a common height and heft now, very evenly matched. He loved the quickness of her, her sleek, slim energy parrying his every lunge and pressing him hard. With Tek, he need never hold back. Jan locked his teeth, redoubled his efforts. On the morrow, he knew, he, Tek, and Dagg—and all the other unpaired young warriors—must depart upon their yearly trek to the Summer shore, there to laze and court and spar till season’s turn at equinox, when most would pledge their mates before the journey home. Tek clipped and pricked him. Jan glimpsed Dagg standing off, absently scrubbing a flybite against the rough bark of a fir, and whistled his shoulder-friend to join in the game—but just then, more quick than Jan could blink, the young mare lunged to champ his shoulder, taunting him with her wild green eyes. In a flash, he was after her. Jan heard Dagg’s distant, startled shout at being left behind as the young prince plunged breakneck downslope through treeboles and shadows. The last rays of red sunlight faded. Moments later, he burst from the trees onto the Vale’s grassy lower slope. The hour was later than he had reckoned, the round-bellied moon not yet visible beyond the Vale’s far steep, but turning the deep blue evening sky to gleaming slate in the east. On the valley floor below, the herd already formed a rudimentary circle. Ahead of him, the pied mare pitched abruptly to a halt. Lock-kneed, snorting, Jan followed suit. Korr, the king, stood on the hillside just below them. Jan tensed as his massive sire advanced through the gathering gloom. “Greetings, healer’s daughter,” Korr rumbled. Jan felt himself stiffen at the black king’s nod. He barely glanced at Jan.
Jan felt apprehension chill him. He had always dreaded Tek’s inevitable choosing of a mate. The prospect of losing her company to another filled the young prince with a nameless disquiet—the pied mare would doubtless be long and happily paired by the time such a raw and untried young stallion as he ever won a mate. Restless, he pawed the turf, and his companion glanced back at him with her green, green gryphon’s eyes. The eastern sky turned burning silver above the far, high crest of the Vale. Tek shook herself. Korr acknowledged her bow with a grave nod as she kicked into a gallop for the hillside’s base. Still paces apart, Jan and his sire watched the healer’s daughter join the milling herd below. Jan felt a simmering rush. “Perhaps I’ll join her,” he said impulsively. The young prince bristled. Behind them, Dagg cantered from the trees and halted, plainly taken by surprise. He glanced from Korr to Jan, then bowed hastily to the king before continuing downslope. The young prince snorted, lashing his tail. The king’s eyes pricked him like a burr. “Be sure I will choose when I know myself ready,” he told Korr curtly and started after Dagg. His sire took a sudden step toward him, blocking his path. He did not look back. White moonlight spilled over the valley floor as the herd before him began to sway, the great Ring shifting first one way, then the other over the trampled grass. Jan’s eyes found his mother, Ses, among the crowd. Beside the pale cream mare with mane of flame frisked his amber-colored sister, Lell: barely a year old, her horn no more than a nub upon her nursling’s brow. Korr cantered angrily past Jan, veering to join his mate and daughter as the dancers found their rhythm, began to turn steadily deasil. Jan hung back. Dagg’s sire and dam moved past: Tas, Korr’s shoulder-companion, like his son a flaxen dun dappling into grey; Leerah, white with murrey spots, danced beside her mate. Jan spied his granddam Sa farther back among the dancers. Dark grey with a milky mane, the widowed mate of the late king Khraa whickered and nodded to her grandson in passing, placing her pale hooves neatly as a doe’s. Jan dipped his neck to her, but still he did not join the Ring. Tek swept into view, pivoting beside the healer Teki. The black and rose in her coat flashed in the moonlight beside the jet and alabaster of her sire. Tek’s riant eyes met Jan’s, and she tossed her mane, teasing, her keen hooves cutting the trampled turf, daring him to join her. Daring him. In a bound, the young prince sprang to enter the Ring. Bowing, Teki gave ground to let Jan dance beside his daughter. The two half-growns circled, paths crossing and crisscrossing. Dagg drifted near, chivvying Jan’s flank. Jan gave a whistle, and the two of them mock-battled, feinting and shoulder-wrestling. Tek’s eyes flashed a warning. Jan turned to catch Korr’s disapproving glare. Reflexively, the young prince pulled up. Then, blood burning beneath the skin, Jan shook himself, putting even more vigor into his step. Moondance might have been a staid and stately trudge during his father’s princely reign—but not during his own! Dancers chased and circled past him in the flowing recurve of the Ring. He found his grandmother beside him suddenly, matching him turn for turn. Jan whinnied, prancing, and the grey mare nickered, pacing him. They gamboled loping through the ranks of revelers until, far too soon, the ringdance ended. Moon had mounted well up into the sky. All around, unicorns threw themselves panting to the soft, trampled ground, or else stood tearing hungrily at the sweet-tasting turf. Fillies rolled to scrub their backs. Dams licked their colts. Foals suckled. Stallions nipped their mates, who kicked at them. Jan nuzzled his grandmother, then vaulted onto the rocky rise that lay at the Circle’s heart. Eagerly, the unpaired half-growns bounded into the open space surrounding the rise. Behind them, their fellows sidled to close the gaps their absence left, that the Circle might remain whole, unbroken under the moon. Jan marked Tek and Dagg entering the center with the rest. Jan descended the council rise as the healer Teki rose to take his place. The singer’s black-encircled eyes, set in a bone-white face, seemed never to blink. Jan threw himself down beside Dagg as the pied stallion began to chant. Restlessly, Jan cast about him, searching for Tek. He spotted her at last, nearly directly in front of him, eyes on her sire. Contentedly, Jan settled down to listen to the singer’s fine, sonorous voice tell of the defeated unicorns’ wandering across the Great Grass Plain. After months, Halla’s ragged band stumbled onto the shores of the Summer Sea, watched over by wind-soaring seaherons with wings of dusty blue. “So Halla, princess of the unicorns, made parley with these herons, to treat with them and plead her people’s case,” Teki sang, turning slowly to encompass all the Ring beneath his ghostly gaze. 31 Days of Autumn by Fallowfield, C.J.